The following is Kong Tsung-gan’s (江松澗) classic essay on the Hong Kong pro-democracy movement at this crucial moment in Hong Kong history. It has appeared in various versions on Hong Wrong Blog, Open Democracy, The Reporters, Inc., and 3 Quarks Daily. China’s leaders are onto something. Hong Kong citizens pushing for more democracy are indeed, as People’s Daily, the Chinese Communist Party newspaper, said, colluding “with external forces.” At the top of the list of foreigners influencing the movement: Gandhi, the Rev. Dr. Martin Luther King Jr. and Jesus Christ. As pro-democracy activists in Hong Kong continue to push for a greater say in the election of the city’s leader, top officials in mainland China closed discussion on the matter, claiming any restrictions placed on the vote are done so for national security. Hong Kong, a special administrative region of China, is set to have its first direct vote of the city’s chief executive in 2017, but Beijing says a nominating committee must approve the candidates. Democracy advocates fear Hong Kong will only have pro-Beijing candidates to choose from, defeating the purpose of the election. The government’s consultation exercise on political reform was dominated by “orchestrated” bloc submissions, most of them favouring a conservative stance, a South China Morning Post study has revealed. More than 90% of 121,447 submissions to HK Gov electoral reform consultation were based on templates and submitted collectively by 822 groups- most of which were not named. 80% of submissions to HK gov public consultation on electoral reform were made by unidentified groups using templates. Pro-CCP DAB made 12.7% of submissions to HK gov electoral reform consultation, most nearly identical. 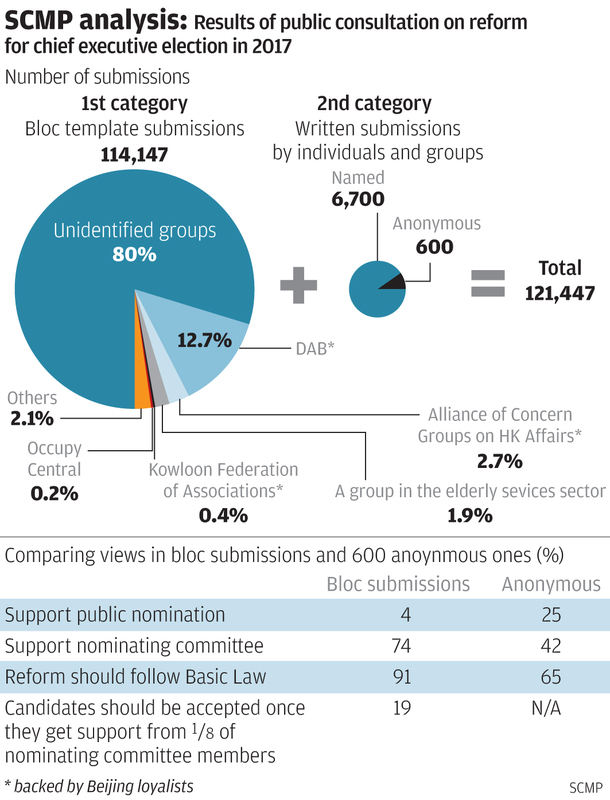 Unidentified groups & DAB are 92.7% of group submissions to HK consultation on electoral reform. When the forces that hold power organize a street demonstration against the forces who don’t hold power – that is, the government holds a march against the populace – you know something strange is happening. Despite its title, the protest had no positive aim. It was a demonstration against demonstrating. It was demanding that people stop demanding things. It was a march for silence and obedience, and acceptance of unrepresentative (not to say poor) government.